I need a cat whisperer. My cat obviously has a 'tude. Can't you just see it in this picture? Someone needs to whisper to her and tell her to stop peeing on my throw rugs and carpet, 'cause yelling isn't working. 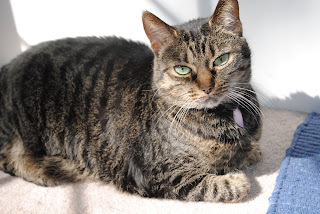 This cat was my kids' first pet. 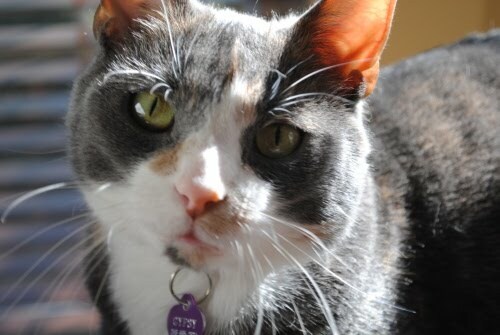 She arrived on our deck six years ago with her mama and sibling, all feral. We weren't able to handle the sibling and mom, but she came right up to us. My daughter begged to keep her, and I quickly told her she needed to ask her dad when he came home. Let him do the dirty work, I figured. However, I did not expect a few seconds of eyelash batting to be so powerful, and we soon owned our first pet as a family. 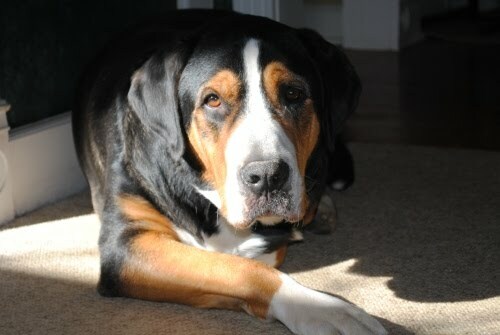 All started out fine, until we began introducing more animals about five years ago, one more cat and two dogs. Even then, things were not so bad. She just kept to herself, occasionally gave a swat or hiss, and spent the rest of the time giving dirty looks. Then, about a year ago, she started leaving little deposits "in order to keep the dogs away", according to the vet. The dogs just thought she was leaving them treats (ew). However, the last several months, she's been a bit more outspoken. All over my carpets. I haven't caught her in the act yet, but I know she's the guilty one. Each night she has been perching herself outside the laundry room, which contains her box and food, and guards her territory before the dogs go to bed, eyeballing them if they get too near. This cat is evil has issues. I'm really desperate here. 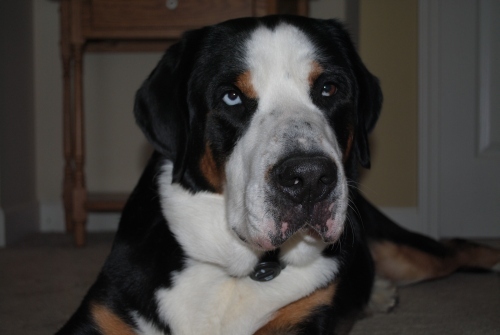 The vet says this is purely behavioral. We've added new boxes where the dogs don't roam as often, to give her some more space. It has only created new territories for her to claim and christen. I've tried containment at night in the laundry room, which makes her more angry. A few people have told me to cage her for 6 weeks to retrain her. Does anyone have experience with this in a territorial situation? She knows where she is supposed to go, she's just mad at the world. She can't go outside as she has no front claws and isn't very "street smart", based on the couple times she's slipped out and returned 24 hours later starving. I'm afraid we are going to have to get rid of her. However, I'll have two devastated kids. Suggestions? Recently Denise over at Got Chai posted about a very clear and awesome dream she had. Even since, it has had me thinking about dreams. My dreams reflect my waking thought process...which is never in a sequential manner. My husband calls it "cave hopping" and that my thought process is like exploring caves. It never goes in a straight path and sometimes I get sidetracked when I'm exploring, prolonging arriving at my final destination. Often times, I never reach my final destination! My husband says he has a filing cabinet in his brain. He selects the well-organized drawer and pulls out the file he needs. BORING, I say! Anyhow, as a result of my waking thought process, my dreams are always this strange and twisting series of events that may or may not be related. Often, they are just plain weird. If I think really hard, I might find rhyme to reason for them, but it takes a bit of digging. It makes for some interesting dreams, but sometimes I'd like to have a dream that actually makes sense with clear meaning! My son is much more like me when it comes to how he thinks. The recent dream he shared with me proves it. He says he was in charge of walking a rather unruly dragon (he walks a neighbor's dog on occasion) and he was having trouble trying to get it to behave. Then, he discovered that having the dragon listen to a certain kind of spelling CD tamed the dragon! We recently started a new CD-based spelling program to supplement over the summer. I can't say my son is thrilled with it, but he isn't thrilled with spelling in general. But what exactly does this dream mean? Are his struggles with spelling as challenging as a wild dragon and the new program is bringing about control? Or, perhaps it was just a silly dream bringing together the days events. I'm surprised his fire-breathing dragon didn't end up eating the disliked spelling CDs. Now that would be clear meaning! I know it seems a bit early for back-to-school specials being only mid-July, but they've been cropping up all over the place. Staples has started to run weekly specials. I missed out on some great items that were only a penny last week, unfortunately. I've also spotted great deals on spiral notebooks (15 cents) at both Meijer and Walmart. 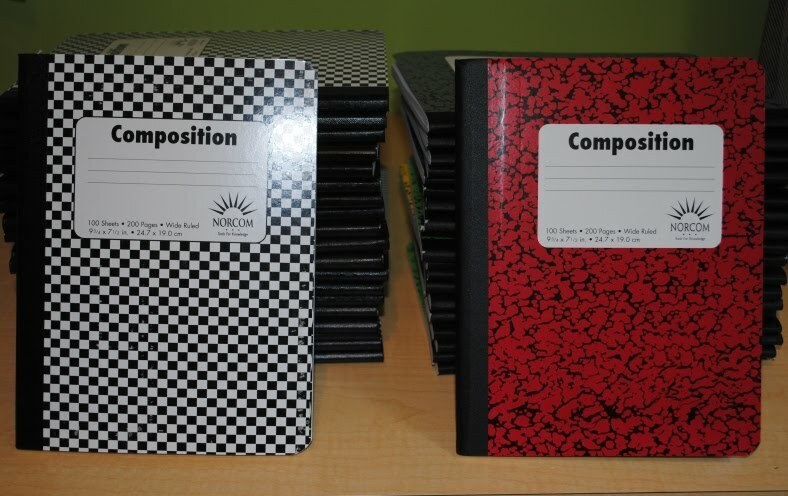 We don't need a ton of supplies this year, but one thing we use a lot of that is hard to find on sale during the regular school year is composition notebooks. My daughter uses these for her math work, stories ideas, music lesson notes, etc. The cheapest that I can normally find them is for $1, but Walmart currently has them on sale for 25 cents each! I purchased 40 and am debating on whether I should go back for more. If you haven't already, now is the time to stock up on those supplies that you use all year. One of the projects that kept my June particularly busy was a remodel of my daughter's room. 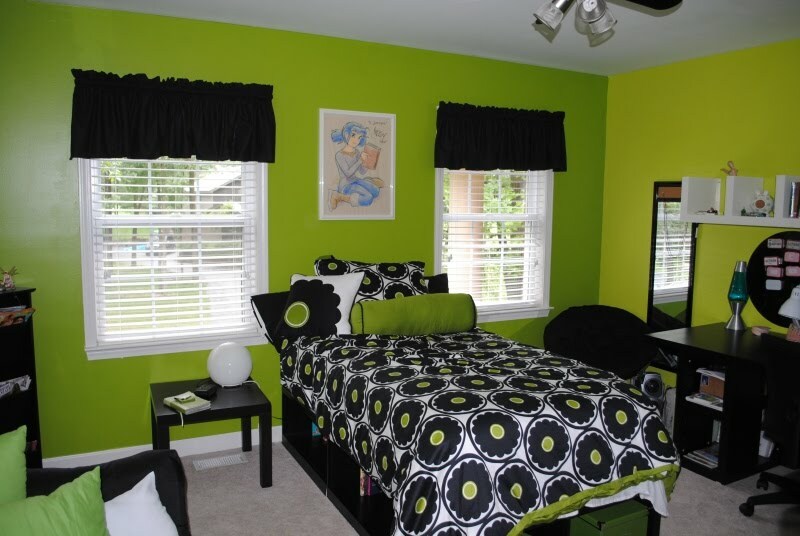 She's 13 and it was time to change her little girl room into something a bit more grown up. We moved into this house when my daughter was just four. She wasn't exactly thrilled with the move and, well, we weren't opposed to bribery within reason. (smiles) We enticed her with a new outdoor playset (which was on the agenda anyhow) and a loft bed, which my husband actually built. 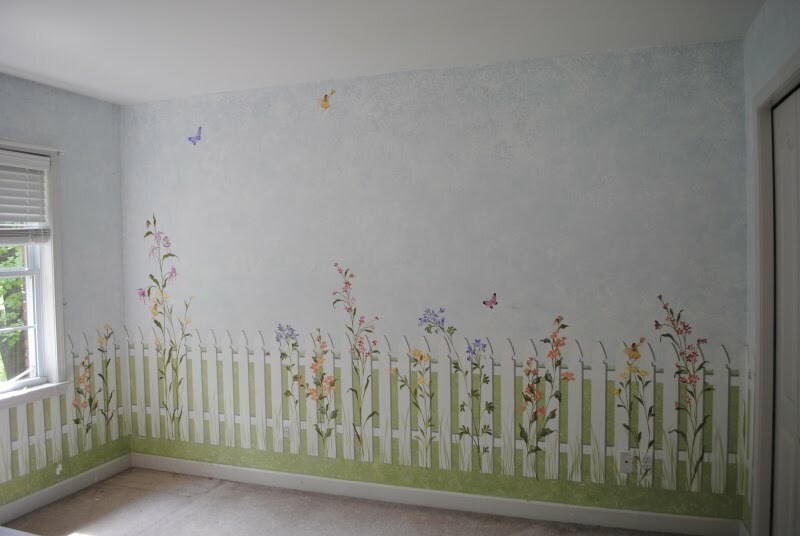 We topped it all off with a four-wall mural "garden room". 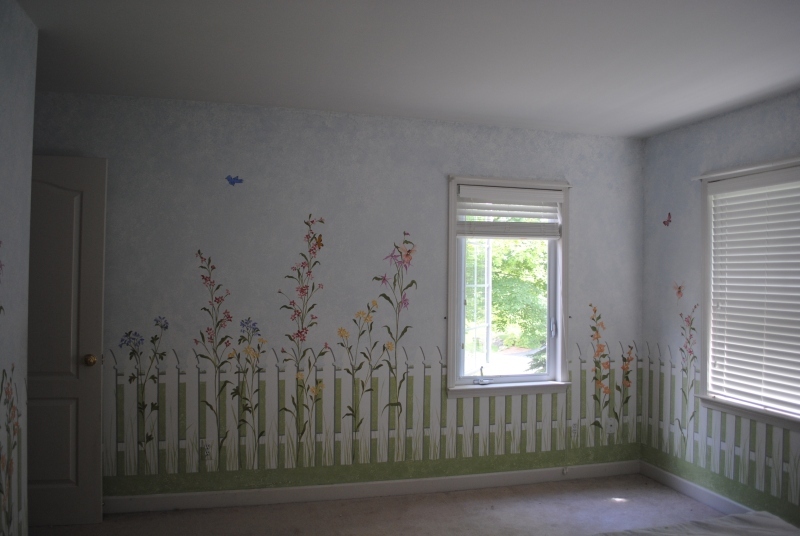 I painted the sky, grass, and picket fence myself and then had someone come in to paint the flowers. 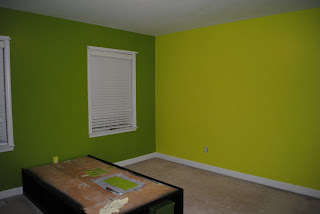 I snapped a couple of pictures before we completely cleared out the room for the remodel. At one time, the loft bed had a canvas enclosure, which I painted to look like a brick house, that wrapped around the bottom. A little purple couch was kept underneath and it made for the perfect reading spot. 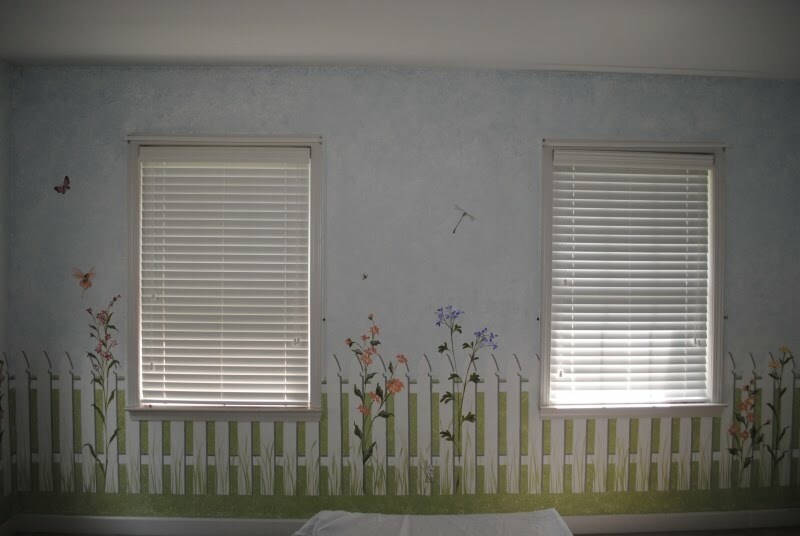 I must say, the room was adorable and the perfect little girl room! 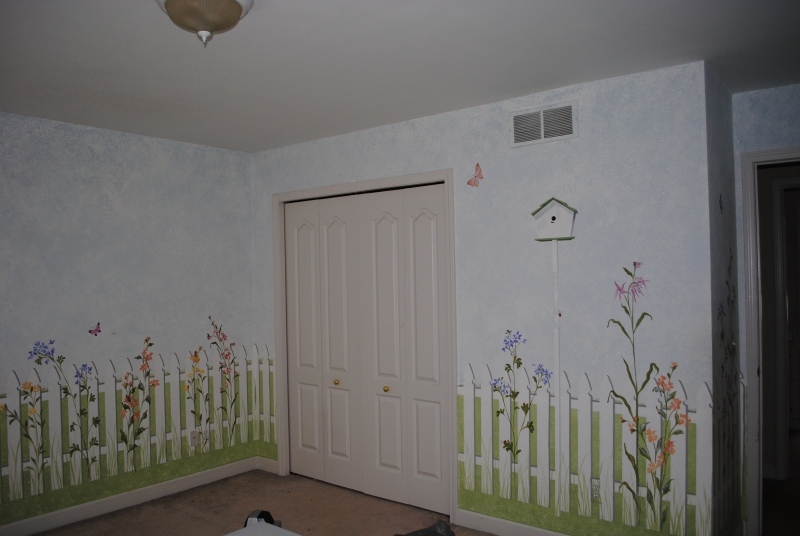 And here are some pictures after all furniture was cleared, which better show the artwork on the walls. 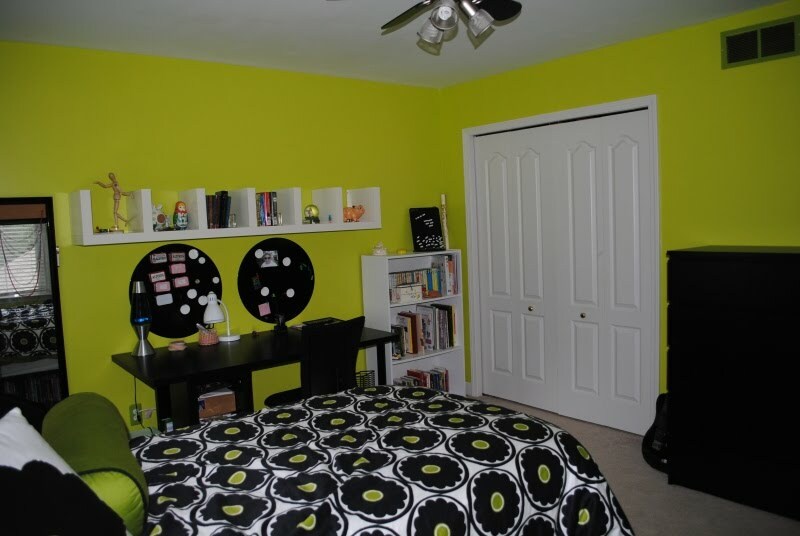 While adorable, this room wasn't exactly suited for a teen. 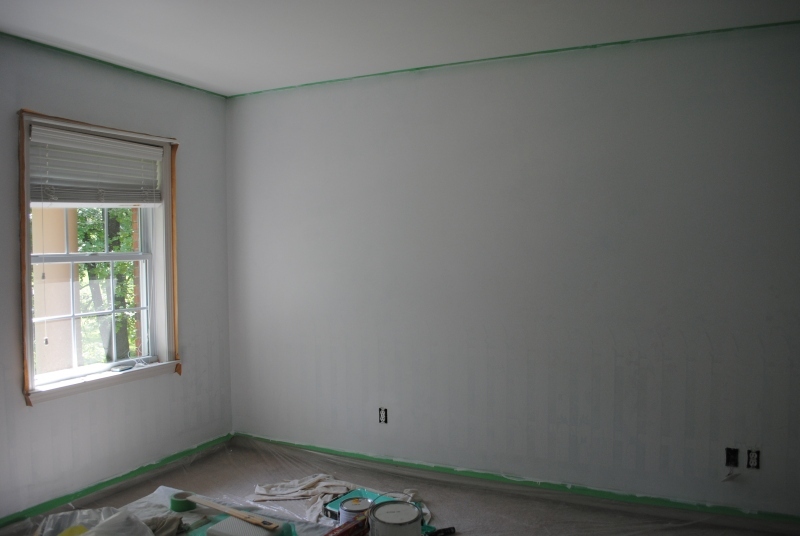 The first step was to sand the walls because some areas had up to six applications of paint. We sanded. And sanded. Then, we sanded some more. There was dust everywhere. 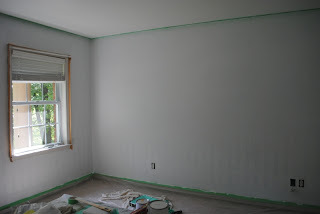 I spackled some areas (then sanded again). This picture of the post-sanding sort of sums up how I felt about the project....our little girl was fading away. All is still bright though. Very bright! Bright green that is! I used two shades of green, one wall a bit darker than the others. It took three coats of each color and the humidity really slowed the drying process down. 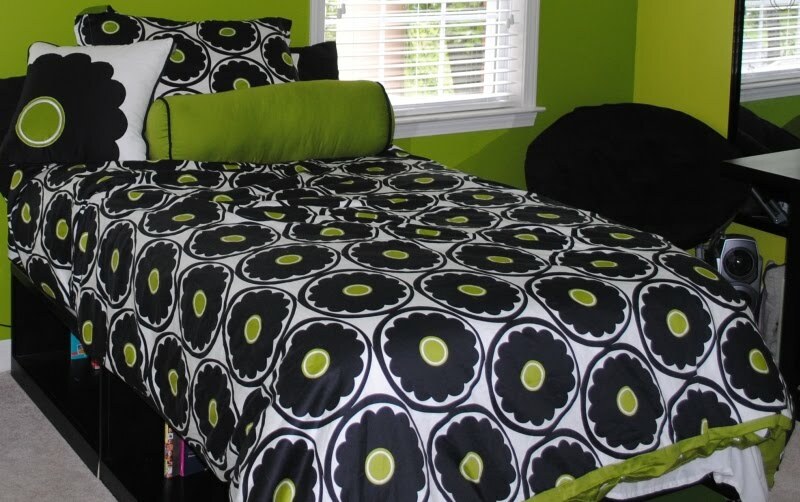 The color scheme was selected after finding the perfect comforter to suit my daughter's personality. 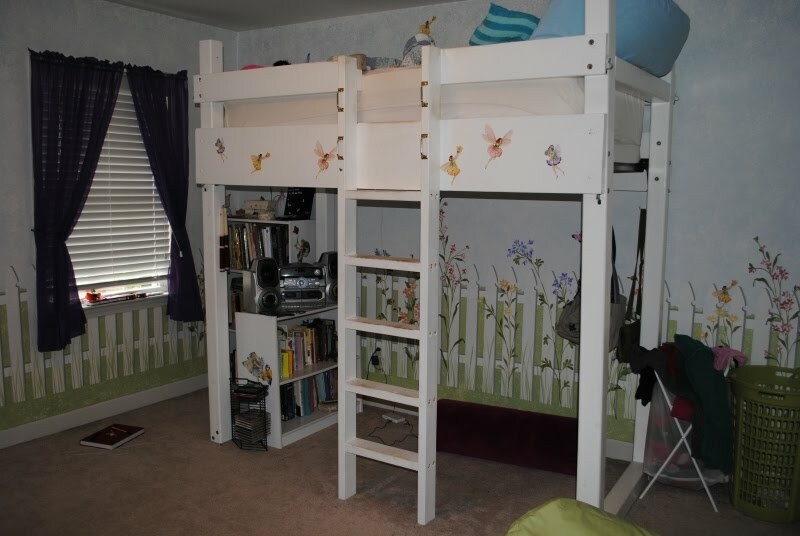 The homemade loft bed went to our 4-year-old niece, who was thrilled. I sold my daughter's old dresser and desk on Craig's List. She has never had new furniture and we thought she should be able to pick her own items out for once. 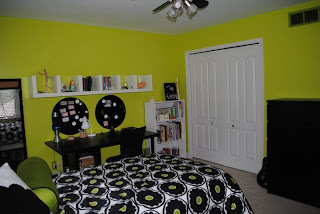 Here is the finished room! To keep within our budget, we shopped mostly at Walmart and Ikea. The couch (Walmart) is a futon that folds out on the sides, creating an extra bed for overnight guests. 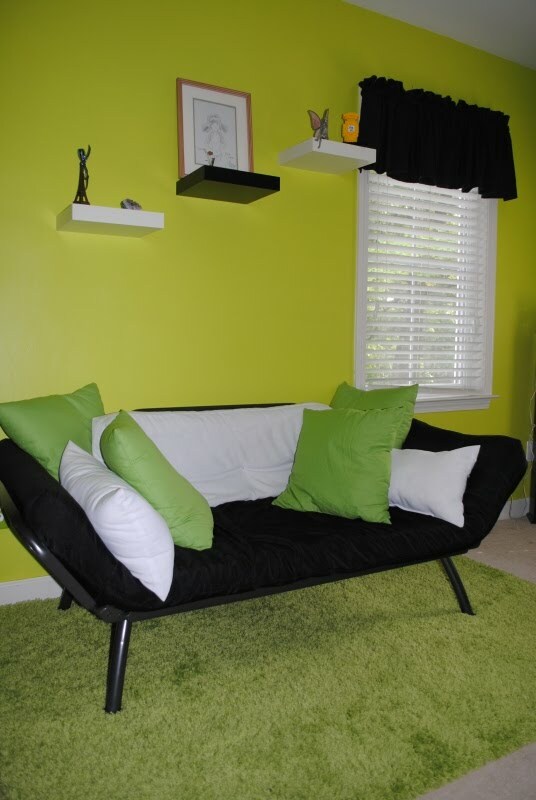 The shelves, shag rug, and green pillows were Ikea purchases. 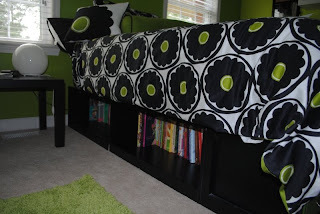 The bed (Walmart) has extra storage underneath...for books, of course! The end table was an $8 purchase (Ikea). What a bargain! I was unsure about the globe light (Ikea) my daughter selected, but it looked perfect on the end table and looked great with the circles on the comforter. 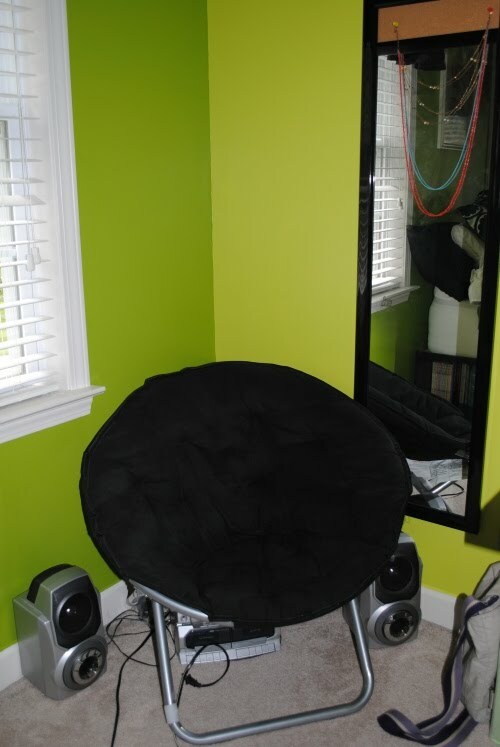 This bucket chair and mirror (both Walmart) were last-minute purchases that ended up filling a corner nicely. The mirror has a wipe-off marker - perfect for making notes while doing work at the desk sitting next to it. 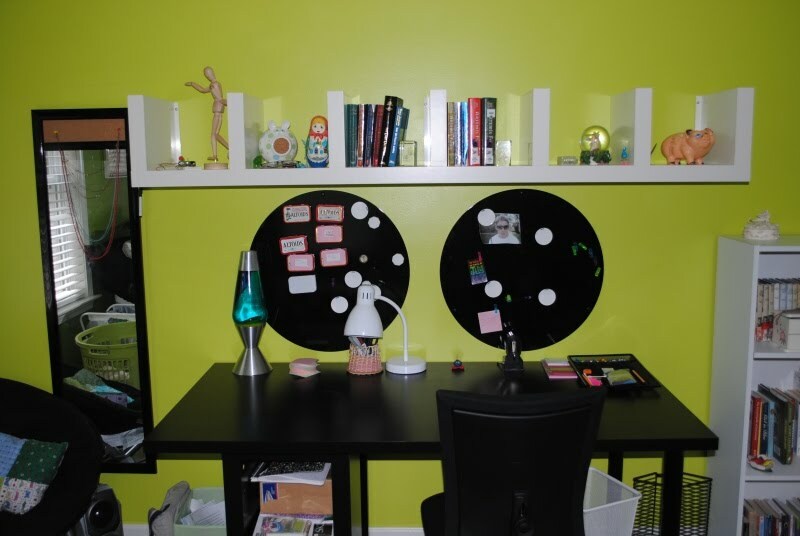 The shelves, desk, and magnetic boards were all Ikea finds, with the white lamp coming from Walmart. The shelves to the right had been in the room previously, one of the two existing pieces. The other was a magazine rack that came from another room, that can be viewed sitting in the corner in one of the earlier photos. 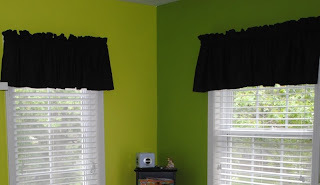 I tested my seamstress abilities and sewed the curtains myself, a $40 total savings from the store-bought variety and made with better quality fabric as well. Our final purchase was a 6-drawer black dresser from Ikea (visible next to the closet in a previous pic), which replaced an old wide white one. 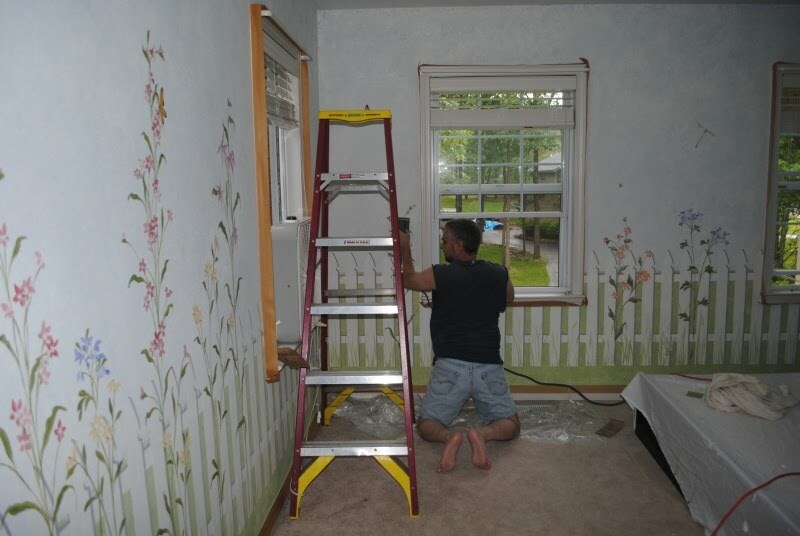 It definitely doesn't look like a little girl's room anymore. 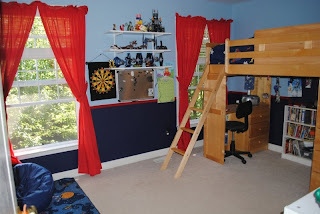 While my daughter helped pick out some of the items, we remodeled everything while she was away a camp and she really didn't know what to expect, including the final wall color. I'm happy to say she loved it! Look Mom, it's still clean! ....not! It didn't take long at all. The Lego pieces first appeared yesterday. My son promised that when he was done with his creation, he'd clean up the remaining pieces. He showed me the (really cool) creation this morning, and I reminded him to clean up the floor. What you can't see in the pic is the closet door open with dirty clothes on the floor two feet from the hamper. Did you notice the wipe off board that is now hanging from one side. Nice touch, eh? Sigh. To nag or allow natural consequences, that is the question. Look, Mom, it's still clean! 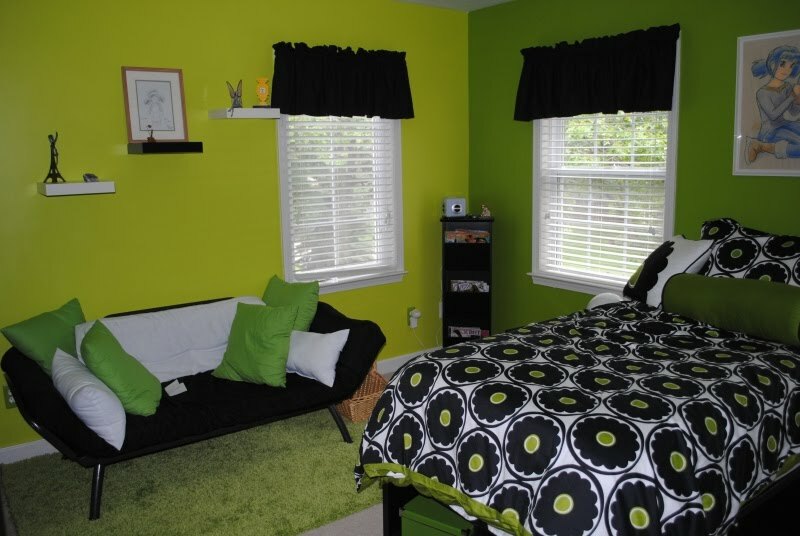 When my daughter went away to camp recently, we gave her room an overdue remodel. 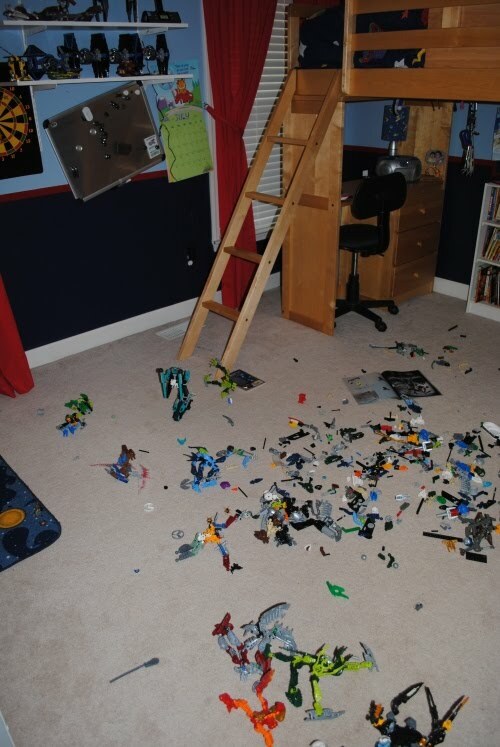 Just to be sure this wasn't going to cause any bad feelings with my son, I asked him if he was wanting something changed in his room when he went off to camp a few weeks later. I was relieved when he indicated he didn't want a remodel or any major changes. What he did say gave me a chuckle though. "No, Mom, I just want to you to clean it." Yes, my son was requesting maid service. Now, his request wasn't completely off base. I do tend to purge the "stuff" in my kids' rooms when they are gone. By not witnessing the event, they don't know what to grumble about missing! 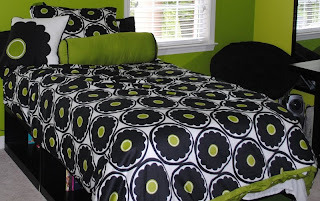 (wink) In the process, their rooms usually do get cleaned as well, since you have to remove the piles to purge. I wasn't so sure about him coming to expect this service, though! Rooms are one thing I'm a bit lax on. They have to live in there and they all come equipped with handy doors to block it out to others. However, when they start to emit an odorous funk or the floor is no longer visible, I do demand action. Let's just say, the room cleaning couldn't wait until camp. For the past few days, my son and I have been slowly organizing and purging "stuff" from his room. Here are the end results. Look! We found the floor! I have permanent proof that a clean room is possible. I wish I had taken a before shot, but am sort of glad I didn't at the same time. It was pretty awful. We finished the task yesterday afternoon. The funniest part is when my son came to me this morning and said, "Mom, come look at my room! I've done stuff in there and everything...and it is still clean!" Yep, 15 hours of clean. I think it might be a record. This spring my daughter went through a huge application process for a highly selective scholarship for high school expenses. Being homeschoolers who plan to continue homeschooling through high school, we didn't exactly fit the profile of past recipients. I knew this going in, but I was told that online tuition would be considered applicable expenses, though the organization was really looking for students to attend a brick and mortar school (I later found out many recipients attend boarding schools, which is definitely not in the future in our situation). Honestly, though, it was too big of an award not to give it a try, since my daughter met all the academic criteria (it was strictly merit-based) and we could really use some financial help to see us through high school. Of course, it wasn't just mom learning; my daughter learned quite a bit too. This application required quite a bit of paperwork, essays, and projects from her. Reflection on past and current academic and extracurricular activities and ranking them in importance was a part of the application. She had to think about past honors and awards and again judge them on personal value. She had to carefully select which topics, some quite thought-provoking, to use for her essays. Also, a sample of previous work was to be selected and included. By the time the whole process was done, we were both glad to see the portfolio off. In recognition of her hard work, I wanted to share one of her "essays". Applicants had the option of using an alternate form of media for at least one topic. For one question, "If you could talk to anyone who you have read about, who would it be and what would you ask? 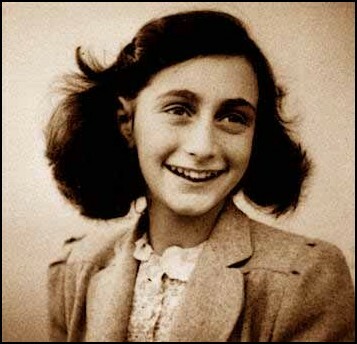 ", my daughter decided on a video project about Anne Frank. She skipped a monthly art class to have some focused work on the project. When I returned home with my son, it was nearly completed. I think she did a fabulous job and just had to share! Please click the link to the right of the photo below. Note: There is one rather graphic picture from a concentration camp in the video. Please make sure you don't have any unprepared children within viewing range and use your own discretion. I was going to embed the video in this post, but YouTube has selected this particular photo for the preview photo. Sure, we would have loved to have received a call today to schedule an interview for the next step, but things don't always work out that way. I have no doubt that she would have received the scholarship, if that is what would have been best for her. Perhaps not having the funds will allow more freedom in our selections or will spark creativity that will result in better resources that we wouldn't have found otherwise. Either way, I'm thankful for what we learned with the process of applying and I feel much more confident about future college applications! Thanks to Pebblecreek over at Petra School for giving me this award. I have to say, I was quite tickled. I wanted to make sure I posted it right away! The last time I received an award, I was extremely busy and didn't get to it in a timely manner. When I finally got around to it, the presenter had deleted their comment/award! I was de-awarded! 1. I can't stand the sound of cotton being pulled apart. It is like nails down a chalkboard (which actually doesn't bother me one bit.) Weird, huh? Even stranger, it seems to be hereditary; my daughter can't stand to wear cotton sweaters for the same reason! She complains they are too noisy. 2. I used to be a skydiving instructor. This tidbit surprises many people when they find out. Though I'm not very athletic and not a camper, I spent a good portion of my weekends during my 20s sleeping in a hanger and jumping out of planes. My last jump was when my youngest was just a toddler. Family responsibilities called, though, and my husband and I decided to get out of the sport. I have approximately 435 jumps in my log book. 3. I did NOT want to be a homeschooler. I was a career woman. My "sacrifice" was to become a stay-at-home mom until my youngest was in kindergarten (and only after daycare for my oldest was not working out). Funny how God had other plans and turned it into a huge blessing. I started homeschooling 9 years ago and have yet to decide what I'm going to be when I "grow up". 4. I have no self control if chocolate is involved. No explanation needed. 5. I'm a wannabe knitter, but can't do much more than a knit and a pearl stitch. I'm too impatient (or perhaps, too busy) to really learn much more. Even so, I've done a few projects that were even gift worthy, to family members at least. 6. I was extremely shy as a kid. I was terrified to talk in front of groups or to anyone that I didn't know well. As an adult, some tell me that can't picture me being shy, but I still am! This lady is so funny and shares my love of chai! Check out her Fit Mommy Friday meme, which I desperately need to get back on track with. I love her latest post on her kids' love of books. If you have ever punished your child by taking away books, you'll relate to what Subadra has to say about the topic. She is also the ultimate resource queen; you are bound to find some wonderful tools for your homeschool on her blog. I've always been a frugal person, whether I needed to be or not. In this current economy, I definitely need to be and love the deals that Kristie finds. What I love about this lady, whom I "met" on the TOS Crew last year, is her openness and honesty. Her blog is "real" and personal. Check out her recent post where she calls out those supposed "encouragers". I've never met Debra in real life, but our kids have met each other this past spring at a Latin convention. It's a small world! Check out Debbie's post on cardboard testimonies and watch the video. Our youth pastor recently did a sermon and had some of the high schoolers come on stage with their cardboard testimonies. It was very moving to see God how carried these young folks through life's struggles. This multi-talented lady keeps the TOS Crew laughing. You never know what she might do when things get a bit slow. Make sure you check out her other blogs...she has four total...on lap and scrapbooking, homeschool reviews, and workboxes. I'm not sure how this sweet lady does it all in the same number of hours as everyone else! Heidi is the captain of the TOS Crew and does a fabulous job. Heidi is also fascinated with Disney and has a Destination Disney meme for all you fellow Mickey lovers. She is one busy lady that is beautiful inside and out! 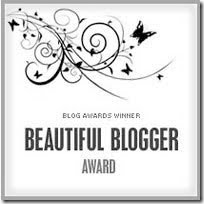 Make sure to give these Beautiful Bloggers a visit! I just finished making my second batch substituting Dr. Bronner's bar castile soap in a lavender scent instead of the Fels Naptha. I like this version much better. I noticed no difference in the cleaning quality nor consistency, but it looks nicer (not a snot color!) and smells nicer. It was slightly sudsier in the making process, but didn't leave a residue in the washing cycle. I can't say I noticed a scent on the clothing when it was washed and dried, but I might experiment later with adding some lavender essential oil. For now, I just dab some on a washcloth and throw it in the dryer with the wet clothes. I just wanted to provide an update for those of you who are in the process of cutting costs, chemicals, or both. I'll continue to update as I experiment with more variations. Most of you are aware that I've been doing homeschool product reviews for the Old Schoolhouse Magazine for the last couple of years. Is has been a fun and blessed adventure. Part of my responsibilities as a returning Crew member (or First Mate) is to sail alongside several new members to the Crew. Essentially, I'm there to answer questions and help them step into the responsibilities of a TOS Crew member for a smooth voyage. Of course, what good is a name without a graphic to show it off a bit? This project really tested my graphics-challenged self, but I managed to come up with something on my very own! While being on the Crew is certainly a joy for me and I love receiving products to review, it is my hope that the readers of my reviews benefit just as much. 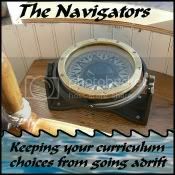 There are so many curriculum choices out there and we all have a limited amount of hard-earned cash with which to purchase it. It is my desire that my reviews, and those of the rest of the Crew, will help make the decision process just a bit easier and help you make some wise decision. All of the above ladies are on the "Older Crew" this year. No, that doesn't reflect the age of the reviewers (ahem! ), but the types of products we'll be reviewing (for 7th grade and up). Please be sure to visit their blogs and read what they have to say about the products they receive. You can also read the reviews of all 250 Crew members by visiting the Official TOS Crew Blog. Just when I start to think the homeschooler stereotypes are starting to be dispelled as homeschooling continues to grow, something happens to prove just how far we still need to go. We've all heard the socialization question. I have no idea why people have such strong opinions on such a non-issue in homeschooling. Yes, there are homeschoolers who are secluded from society. I understand that. And perhaps some homeschoolers aren't always up-to-date on the latest pop culture or fashion craze, or are largely unconcerned even if they are. There are also public-schooled students that are socially dysfunctional or too driven by popularity and the latest thing that is "in". However, those in the homeschool community know, when it comes to social skills that count, homeschoolers are usually ahead of the game. Homeschoolers have more opportunity to interact with those outside of their exact age peer group and are exposed to many more real-life situations. They also aren't afraid to interact with adults. Apparently an adult that had recent interaction with my 13-year-old daughter didn't realize this. My daughter spent the last week at a camp for girls interested in technology. The girls learned things such as web design, robotics and game design. As part of the camp, women working for some of the corporate sponsors came in and spoke with the girls over lunch about their jobs. I really appreciate these women, especially as a mom who was in a field dominated by men. However, my daughter reported to me one day that a mentor from Google became quite inquisitive about the fact that my daughter was homeschooled. After talking to my daughter for a bit, she says to her, "You are very mature and well-socialized." Well-socialized? I know it was meant as a compliment, but would she have said this to any other girl there other than a homeschooler? What, exactly, was this mentor expecting? Did my daughter perhaps break down some stereotypes? When my daughter told me this story, the first thing out of my mouth was a sarcastic, "Did you tell her that your parents unlocked the closet for you to attend camp?" It is just the sort of snappy comment that I'd like to say when I hear these sort of things. "No," my daughter replied, " I just told her that is isn't like people think. We aren't always working one-on-one and we get out and do many things." Of course that is what she said, because she knew a snappy comment would not be appropriate. Unlike many teenagers today that are being socialized by their peers, my daughter is well-socialized. I know the idea was for my daughter to learn from the mentor, but I hope that mentor took home a new perspective of homeschoolers that day. Back on schedule...at least for a couple of weeks! 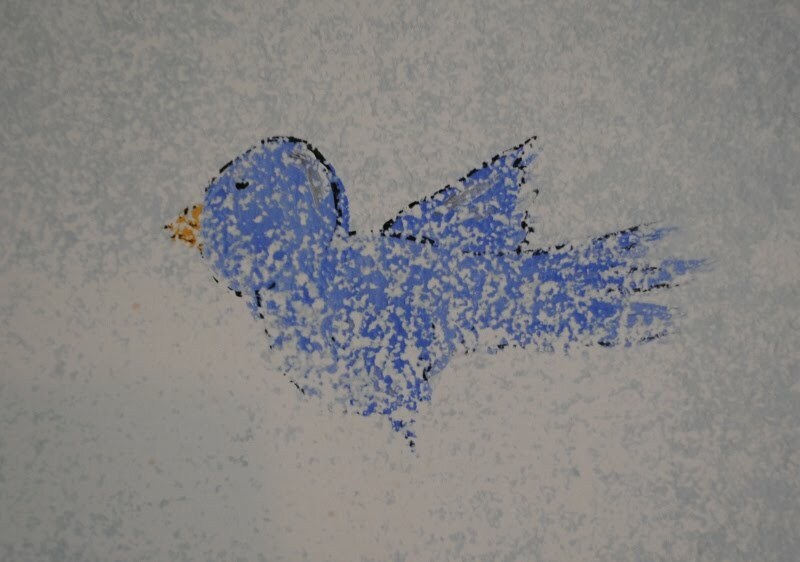 A hectic month has prohibited me from posting much. 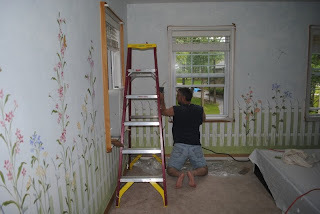 We had a string of family birthdays, including yours truly, the birth of a new nephew, a couple weeks of camp, a remodeling project, and several other must-do tasks that took precedence over blog posts. Now that is all behind me, I'll be trying to make more of a presence and will share some of our exciting happenings soon.